Stitch up a colorful kaleidoscope of crochet! Explore a lively twist on crocheted motifs as you shift through various shapes and color combinations. From the traditional granny square to more complex forms, these faceted motifs are the building blocks to creating unique and stunning designs. 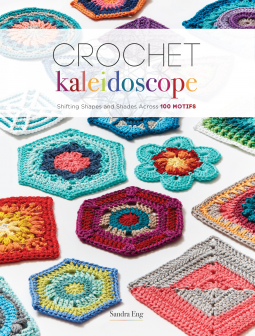 Crochet Kaleidoscope will help make your projects pop with the perfect mix of color in every stitch. Along with a collection of 100 fresh motifs, this book includes a complete guide to choosing yarn colors, what order to put them in, and how many to include. Plus, get five home decor and accessory patterns including a table runner, pillow, and rug from crochet designer and author Sandra Eng. You can shift shapes and shades to make the perfect piece for your home. Every turn of the crochet kaleidoscope allows you to get creative with color and apply your own unique personality to your crochet motifs. I am completely floored with this book. I do not normally crochet a lot due to preference to knit, but this book has given me so many ideas for shawls, blankets, rugs, sweaters, the list could go on & on. As you read through the book you can tell that Sandra Eng has really taken the time to explain how to do each motif and even gives you the graphs along with the written instructions. Along with the instructions on how to read crochet charts which I still have issues with even though I learned to crochet when I was seven, lol. The book is brimming with 100 motifs that you can mix and match to create a wonderful project. If you crochet or even if you are learning to crochet & enjoying it. This book NEEDS to be part of your crochet library. With 100 motifs you can leap from there to making all kinds of projects with them.